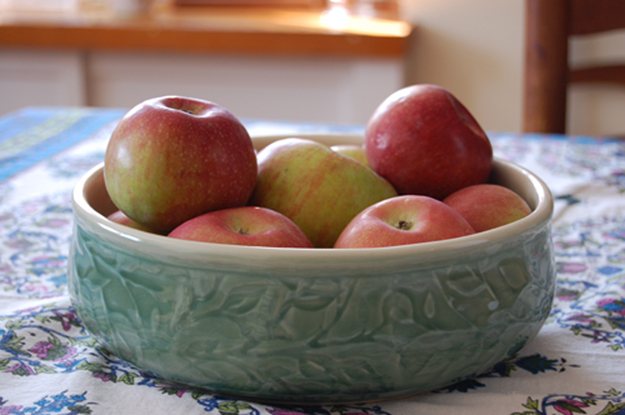 CHARITY ROBEY PHOTO | A bowl of Macouns from Wickham’s Fruit Farm in Cutchogue. According to Governor Andrew Cuomo, this year’s New York apple harvest is one of the best in history. That is good news in my household, where the fruit flies shake their heads in disbelief as our boys beat them to the apples. Even our hound takes part in the feeding frenzy. Only 12 inches high, he can take a running start, elevate several feet, arch his body and snag a Macoun from the fruit bowl. Since the governor’s instructions were to “taste the variety of products from our vibrant apple industry,” I decided to try some new varieties in cooking. This recipe for apple crisp uses the three varieties that Tom Wickham recommends as ideal for cooking: Cortland, Mutsu (aka Crispin) and Jonagold. I like to slice the apples very thin with skins on to get more flavor, texture, and a nice rosy color in the cooked apples. There are two new apple varieties being grown in New York State, and Mr. Wickham reports that one of them, Snapdragon, will be available at his farm next year, from trees that were planted last spring. Snapdragon has the spicy sweetness of a Honeycrisp but is much easier to grow, stores better and is red and juicy. That sounds good enough to make my hound howl at the fruit bowl. 1. Preheat the oven to 375 degrees and butter an 8-inch-wide, 4-inch-deep baking dish. 2. Toss the peeled, sliced apples with the lemon juice and put into the buttered dish. 3. Mix the brown sugar, flour, oats, butter, nuts, spices and vanilla together in a bowl, squeezing and rolling with your hands until the mixture is crumbly. 4. Sprinkle the sugar/oats mixture over the apples in a rough layer. 5. Bake about 40 minutes or until the topping is browned and the apples are fork-tender. 6. For dessert, top with whipped cream or ice cream. It also makes a fine breakfast, topped with a 1/4 cup of heated milk.